There's a veritable raft of tweaking, optimising and cleaning utilities on the market to ensure that you're able to keep your Operating System's Registry in peak condition. Each will promise to yield speed gains and boost the general well-being of your system. Well, they're hardly likely to boast at being the best at crippling your PC's performance, are they? 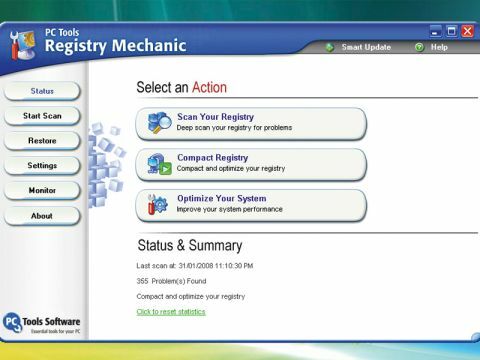 Now in its seventh version, and being one of the more popular pieces of software in the area, PC Tools' Registry Mechanic should be somewhat of a refined offering. Indeed, your PC's Registry is not something that you'll want to leave in the hands of an untrustworthy and/or poorly made utility. Plenty of viruses would leap at the chance to change a few of the wrong settings and render your PC unbootable. Fortunately, Registry Mechanic acts quickly to demonstrate that it's a well-made and trustworthy utility. The application sports a tidy and attractive interface, neatly presenting its main functions (Scan Your Registry, Compact Registry and Optimise Your System) on the main screen. A large part of the reason that there's a good deal of choice out there when it comes to Registry tuning is that, over its life, your Registry will accumulate a fair amount of junk. Each time you install and uninstall a piece of software, for example, there's a good chance that it will leave some "orphaned" Registry keys as a parting gift. As such, an increasingly bloated Registry is a natural consequence of general PC usage and meant that we weren't surprised to find that on scanning our system with Registry Mechanic, we found that it had a grand total of 355 problems. After the scan you're provided with a detailed breakdown of the irregularities that have been found within the core of your OS. These are categorised under headings such as File Extensions and Shared DLLs and displayed by priority (high, medium or low) with the relevant Registry directory also shown. Once you've finished exploring these various Registry imperfections, curing them is as straightforward as clicking Repair. A couple of seconds after doing this we were free of all Registry problems, as a second scan confirmed. We've occasionally used rival programs that have still found problems following an immediate rescan, so the lack of this in Registry Mechanic's case bodes well for its efficiency. Any car mechanic worth their City and Guilds should be capable of more than just fixing the most crippling problem that you present them with. Happily, this is true of Registry Mechanic, too. Having scanned and repaired your Registry, the program can provide it with a bit of a tune up, streamlining it by removing gaps and general bloat. Having chosen to do this, the software again scanned the Registry, dimming all but its own window in dramatic fashion. As before, it then presented its findings, this time concluding that it could free up 1MB of our 66MB Registry. As a final party piece, Registry Mechanic is able to sit in your System tray and monitor your Registry for any changes made, enabling you to stay abreast of things. Although you're unlikely to either learn anything of great worth from this feature or diagnose potential problems as they happen, it's a nice touch. While we can't say for certain that we noticed any dramatic performance increases having run the software, things did seem fractionally smoother and our system was certainly no worse off after its brush with this comprehensive and easy-to-use suite of Registry tools.